Ford Motor Company has announced that the 2016 F-150 pickup trucks with 5.0-liter V8 engines will have an option to run on propane natural gas or compressed natural gas (CNG). Ford made the announcement on May 4, 2015 at the Alternative Clean Transportation Expo in Dallas. Spokesman Mike Levine stated that dealers would begin taking orders for these vehicles in the summer of 2015, and they would be available for sale in the winter of 2015. Ford fleet manager Jon Coleman added that the option for alternative fuels was driven in part by a survey of customers who were likely to use such fuels. Seventy-two percent of the respondents in that survey reported that they want alternative-fuel options on the F-150 with the 5.0-liter V8 engine. The CNG option will be available as an aftermarket upgrade on factory-prepped vehicles that includes a kit and installation service by a qualified vehicle modifier. The kit will cost $315 and contain the new valves and valve seats that will be required for the alternative fuels. The installation service will install new fuel lines, fuel injectors and fuel tanks at a cost of $7,500 to $9,500, depending on the capacity of the fuel tank. The tow rating of the modified truck will remain unchanged, but its payload will be reduced by the weight of the new fuel system. CNG is at least 90 percent methane, with carbon monoxide comprising the majority of the remaining portion. Hydrogen sulfide is also added to the mixture after production to provide the smell of rotten eggs as a safety measure. Natural gas is compressed to less than one percent of its normal volume with a pressure of 2,900 to 3,600 psi. It’s then stored in cylindrical or spherical metal containers. Approximately 85 percent of the CNG used to fuel vehicles in the United States is produced domestically. The price of CNG can be as low as $1 per gallon in areas where it’s produced. IMPCO is qualified for both CNG and propane modifications, while the other modifiers are only qualified for CNG modifications. These modifiers are available at 36 total locations in the United States. Ford’s CNG option is motivated by a growing demand for vehicles that burn alternative fuels. The 12th generation of the F-Series, in production from 2009 to 2014, was also available with a CNG option for F-150s with a 3.7-liter V6 engines. Sales on this conversion exceeded Ford’s forecasts, and the automaker expects it to be even more popular for the more powerful V8 engine. The other major brands of trucks also offer CNG conversion options, including Chevrolet, GMC and Ram. 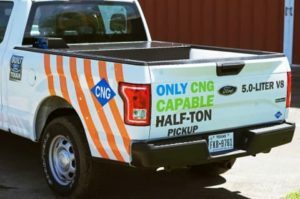 The increased demand for CNG vehicles is being driven by rising fuel prices, especially for fleets seeking to reduce operating costs. Ford reports that the national average price of CNG is $2.11 per gallon. The national average price of regular gas is $2.57 per gallon and $2.81 per gallon for diesel, according to the US Energy Information Administration.